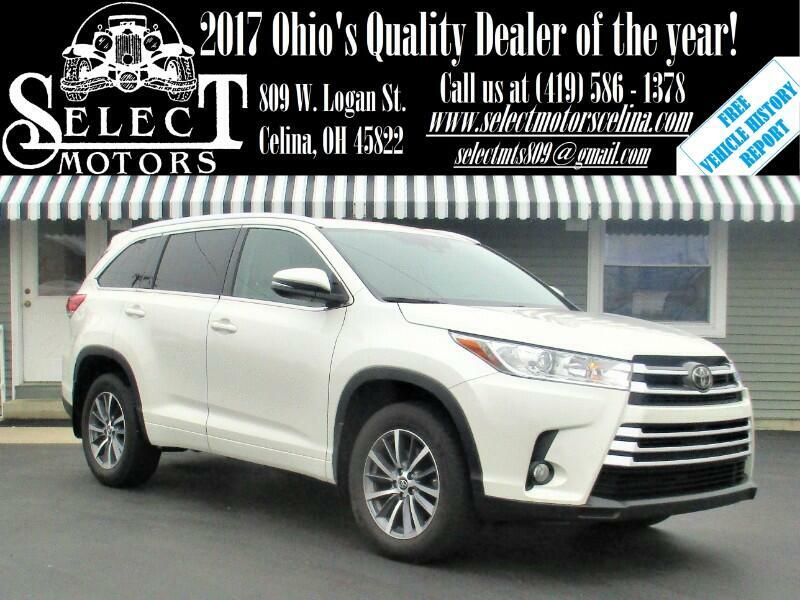 ***TXT US @: (419) 362 - 6200*** AWD, Captain Chairs, Navigation, power moon roof, heated leather, backup camera, power lift gate, blind spot monitors, dual power seats with power lumbar, automatic headlights, fog lights, automatic dimming mirror, heated/signal mirrors, dual automatic climate control, power windows/locks/mirrors, AM/FM, SiriusXM, auxiliary and USB port, steering wheel mounted audio controls, Bluetooth, tilt and telescopic steering wheel, cruise control, information center, 18" alloy wheels. Fuel Economy: 20 city / 26 hwy. Warranties: Balance of Toyota's 3 year or 36,000 mile bumper to bumper and 5 year or 60,000 mile powetrain. In service date: 11/03/2017. Extended service contracts available. The 2017 Highlander is a large three-row crossover SUV with seating for eight, but optional second-row captain's chairs reduce capacity to seven. There are LE, LE Plus, XLE, SE, Limited and Limited Platinum trim levels. The LE isn't a stripped-down model, but its standard four-cylinder engine is a bummer. The LE Plus has key upgrades such as the V6 engine (optional on LE), a power liftgate and tri-zone automatic climate control, while the XLE, Limited and Limited Platinum essentially slather on luxury feature content. The SE stands out with unique styling and sportier driving dynamics. The base LE comes standard with a 2.7-liter four-cylinder engine (185 horsepower, 184 pound-feet of torque), a six-speed automatic transmission and front-wheel drive. The 3.5-liter V6 that's standard on all other trims (295 hp, 263 lb-ft) is optional on the LE and comes paired with an eight-speed automatic. All-wheel drive can be added to the V6 as an option. Other standard feature content includes 18-inch alloy wheels, heated mirrors, a windshield wiper de-icer, rear privacy glass, the Toyota Safety Sense bundle (automatic high beams, adaptive cruise control, lane departure intervention, and forward collision mitigation with automatic emergency braking), a rearview camera, rear air-conditioning, a six-way manually adjustable driver seat, cloth upholstery, a 60/40-split second-row seat (slides, reclines, folds), a 60/40-split third-row seat (reclines, folds), five USB ports, a 6.1-inch touchscreen, Bluetooth, and a six-speaker sound system with a CD player, auxiliary audio jack and a media player interface. The LE Plus adds a height-adjustable power liftgate, a flip-up rear window, foglights, tri-zone automatic climate control, upgraded upholstery and trim, an eight-way power driver seat with lumbar adjustment, a leather-wrapped steering wheel, a higher-resolution 8-inch touchscreen, satellite and HD radio, and a variety of smartphone-connection apps. The XLE adds a sunroof, roof rails, keyless entry and ignition, blind-spot monitoring and rear cross-traffic alert systems, an upgraded instrument panel, leather upholstery (first and second rows), simulated leather third-row upholstery, heated front seats, a four-way power passenger seat, an auto-dimming rearview mirror, second-row window sunshades, Driver Easy Speak (carries the driver's voice through the rear speakers to distant passengers) and a navigation system.